The MS Series utilizes the latest IGBT devices to drive down size and increase performance. 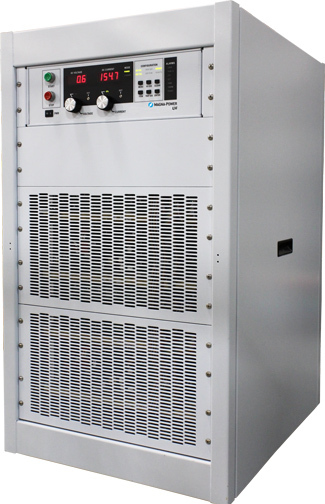 The high frequency design delivers fast transient response and low output ripple. This performance coupled with Magna-Power's rugged current-fed power processing, enables confidence in even the most demanding applications. Various programming interfaces are available, such as LXI TCP/IP Ethernet (+LXI), IEEE-488 GPIB (+GPIB), Edgeport USB, Accessory (+USB), RS485 Accessory (+RS485). Magna-Power Electronics MS Series is built on the same power processing modules as the TS Series, only packaged in a floor-standing cabinet with casters and expanding into higher power levels. The available The MS Series models covers a very wide output range, spanning from voltage levels up to 4000 Vdc (floating) and current levels up to 4500 Adc. Models 30 kW to 60 kW are available in a 38.5” high cabinet, while 75 kW models are available in a 49” high chassis. MS Series power supplies have extensive diagnostic functions, including: phase loss, excessive thermal conditions, over voltage trip (programmable), over current trip (programmable), cleared fuse, and excessive program line voltage. When in standby or diagnostic fault, the AC mains are mechanically disconnected via an embedded AC contactor, providing confidence that the unit is only processing power when desired. For maximum flexibility, all MS Series power supplies can be scaled a in master-slave configuration for higher voltage or current output. Using the plug and play Universal Interface Device (+UID47), units are tied together in via their 37-pin I/O, allowing an increase in system current when configured in parallel or increase in system voltage when configured in series—up to the power supply's output isolation rating. All MS Series power supplies come standard with a National Instruments LabVIEW™ and LabWindows™/CVI drivers. In addition, an IVI driver is included supporting Visual C++, Visual C#, Visual Basic .NET, MATLAB, Measure Foundry, PAWS, Visual Basic 6.0, and Agilent VEE Pro. A Standard Commands for Programmable Instrumentation (SCPI) command set is also supported, allowing programming using raw ASCII commands. Finally, Magna-Power's RIS Panel software is provided allowing for a virtual control panel controlling the power supply via any of the available communication interfaces. There are hundreds of possible configurations for the MS Series product. Using the following ordering guide and models chart to define the best model for your application. Need less power? Visit our TS Series product line. Need more power? Visit our MT Series product line. For maximum flexibility, all front panel function and controls have equivalent programming and monitoring functions on the included rear 37-pin analog-digital I/O connector and on the computer programming interface. The A Version front panel provides a digital display with rotary front panel input, isolated 37-pin analog-digital I/O, and a RS232 computer interface. In addition to the features of the A Version front panel, the D Version front panel provides digital 10-key entry, auto-sequencing with memory capability, and modulation for non-linear power profile emulation. The C Version front panel is blank, providing only a switch to enable control power. All control must be performed by the provided isolated 37-pin analog-digital I/O or through a computer interface. Note: Additional diagrams available for download of MS Series units with Water Cooling +WC option. Utilizing Magna-Power's internal cable manufacturing operations, custom-made DC power cables are offered as an accessory. Available for models rated for 250 Vdc to 1000 Vdc, the +ISO option extends the output isolation, used when the application demands floating or tying units in series beyond the standard 1000 Vdc output isolation rating. The high slew rate option is a control modification and replaces the standard output stage with one of low capacitance film and/or aluminum electrolytic capacitors, capable of high RMS currents. This stage provides higher bandwidth with faster output rise and fall times. Full control of the product's features and diagnostics over a IEEE-488 GPIB interface. The GPIB interface allows up to 15 devices may be connected to one bus and is compatible with all Magna-Power provided software and drivers. The Integrated Blocking Diode Option (+BD) provides an internally heat-sunk protection diode on the positive output terminal of a MagnaDC programmable DC power supply to protect the product's output from reverse voltage up to 1200 Vdc. Full control of all the product's features and diagnostics over a LXI Class C Certified TCP/IP Ethernet interface. Includes an embedded web server and compatibility with all Magna-Power provided software and drivers. The RS-232 to RS422 or RS-485 converter is an external industrial accessory to convert the power supply's standard RS-232. Unlike converters which require programming hardware handshaking signals to control RS-485 or RS-422 operation, the +RS485 option provides automatic control. The UID47 accessory eases master-slave parallel or series configuration of Magna-Power DC power supplies, enabling near equal current or voltage sharing, depending on the configuration. The accessory includes the UID47 with integrated circuitry and (2) 6-ft DB37 cables. The +USB Edgeport Converter plugs directly into the product's RS232 port, creating a virtual serial COM port over USB. The converter is tested with the product by Magna-Power at time of production. Water cooling is available instead of the standard air cooling. Water cooled units are fully enclosed and to not take in any external air, making them ideal for corrosive environments, densely packed cabinets or setups where water is readily available.